Los Angeles isn’t exactly the kind of place that comes to mind when planning a trip on the cheap. 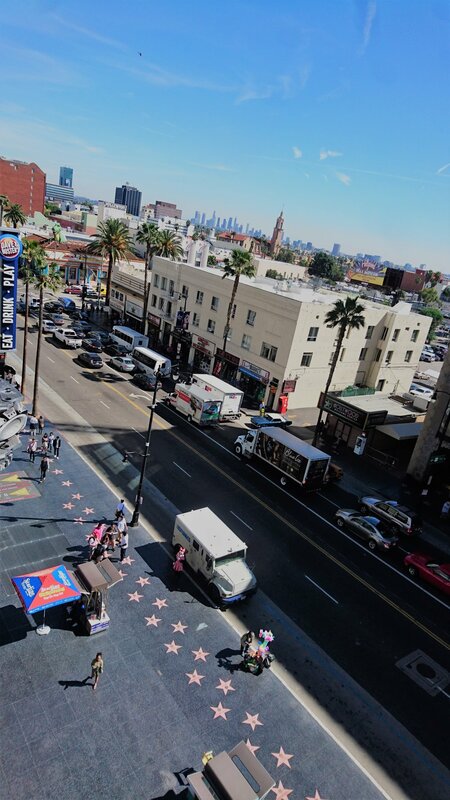 You will easily leave your fair share of dollars in LA, but with some determination you can have a great time and see some exciting sights and history for absolutely nothing. 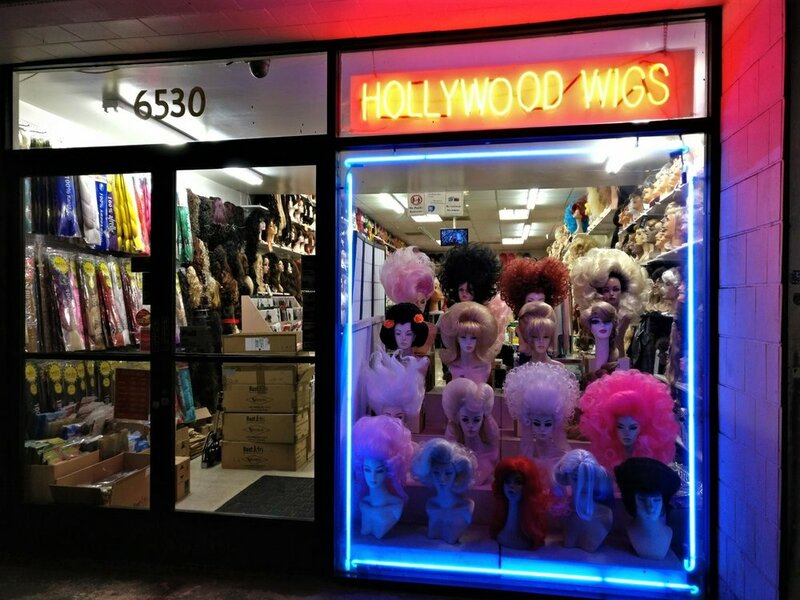 Hollywood and all that glitz might be most people’s first association with LA but the history of this city did not start there. The historic district of El Pueblo de Los Ángeles, with its main street Calle Olvera, is the oldest part and the birthplace of the city. Los Angeles basin had been long inhabited by the indigenous Tongva people by the time Spain’s King Carlos III sent 44 families to the area thus establishing Pueblo de Los Angeles in 1781. The rest is history, a small piece of it that you can experience here. 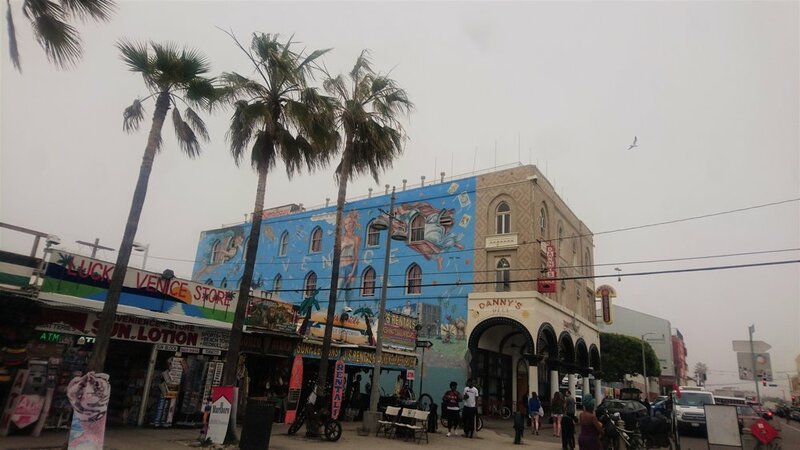 These days it’s a busy Mexican outdoor marketplace, dotted with restaurants and shops. You can buy various kinds of souvenirs and catch a live performance at the Plaza - which is kind of the social centre slightly off Calle Olvera. Another example of well preserved LA’s Mexican and Spanish cultural heritage is the oldest surviving residence building in Pueblo - Avila Adobe. It’s free entry and will give you an insight into what life looked like here in the 1840s. 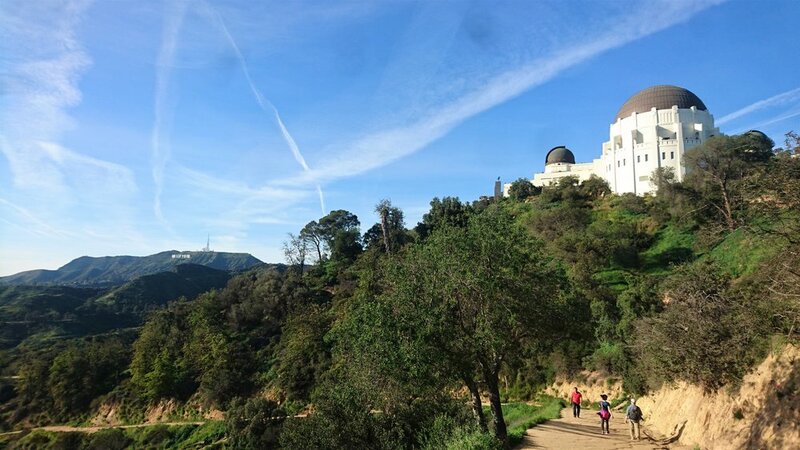 To get to the Griffith Observatory, be prepared for some uphill walking to reach the southern slope of Mount Hollywood. 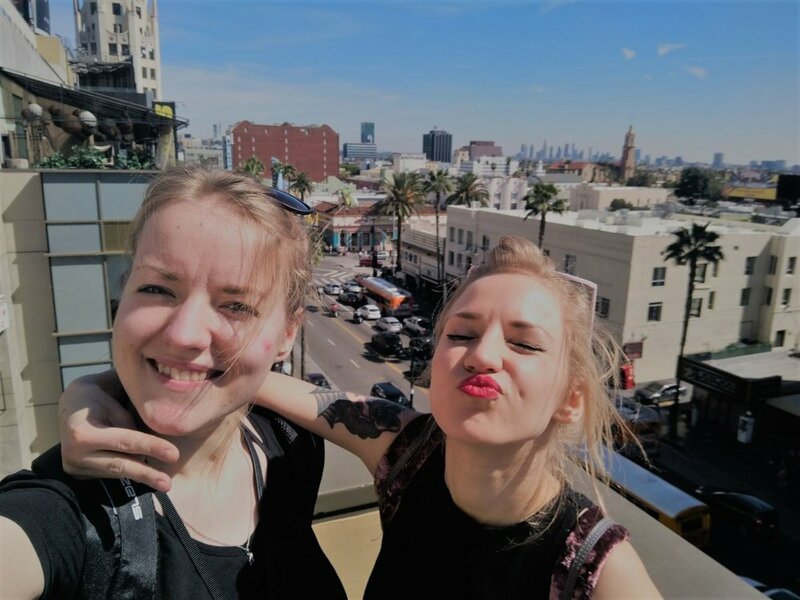 It will reward you with the prime location to take in the views of the city from above and opportunity of taking tons of pictures of that famous sign with a 100% guarantee that they will all look cool and exactly the same. Admission to the observatory is free of charge but note that it is closed on Mondays. 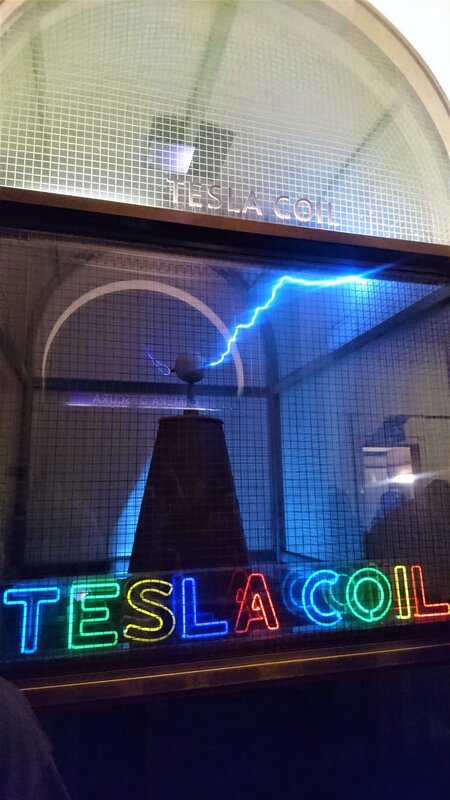 Its most famous exhibit is the Tesla Coil. The staff are giving demonstrations of it several times each day so try to catch it. There is a grassy spot for a picnic and a hang out. 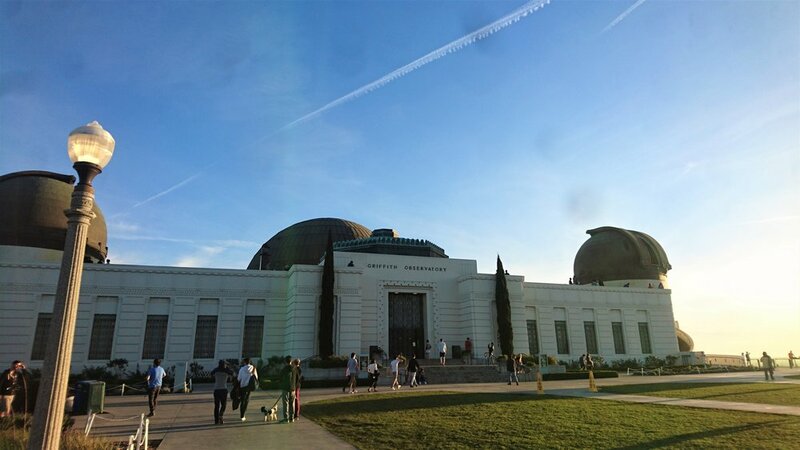 The observatory is usually open late, until 10pm, which makes it possibly one of the prettiest vantage points for watching the sun set in LA. 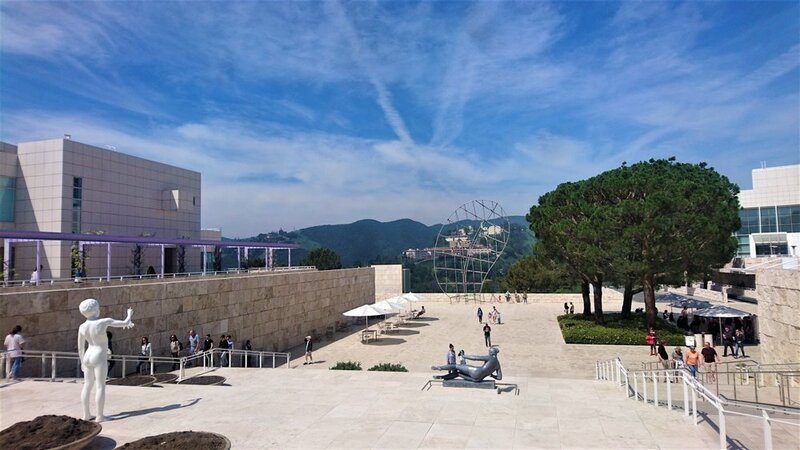 Pretty far out, unless you are lucky enough to be staying in Beverly Hills or Bel Air, Getty Centre is nevertheless worth a trip for all art and architecture admirers. 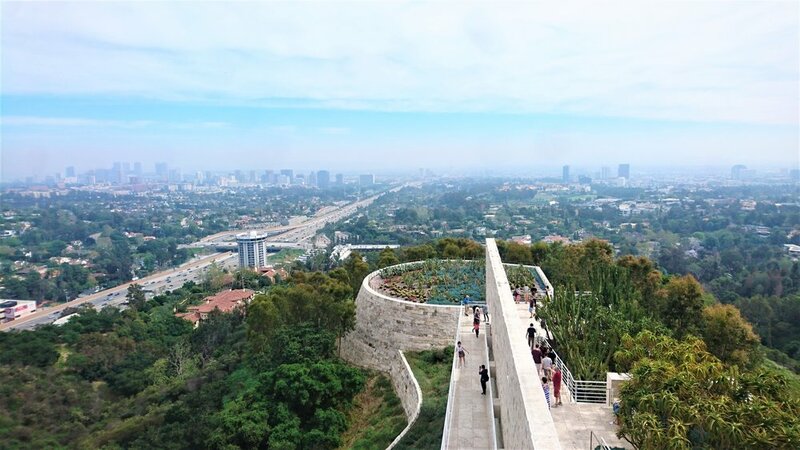 The Getty Centre is a privately funded museum which started from the private collection of billionaire and avid arts collector J. Paul Getty (60% of works currently on display were personally acquired by Getty), made free for public to access. There is a fully accessible computer-operated tram that will take you from street level, just off the San Diego Highway, up to the Santa Monica hilltop entrance. The permanent collection consists of European and American art from medieval to present times. This includes fine art, photography, sculpture and installations. Some of the most well known works on display include Van Gogh’s ‘Irises’, Claude Monet’s ‘The Portal of Rouen Cathedral in Morning Light’, a collection of works by Rembrandt and Marino Mariani’s lovely ‘Angel of the City’. The ever changing temporary exhibitions are free to explore as well. The Central Garden has a collection of contemporary outdoor sculptures and an amazing view over the city, which we couldn’t get enough of while we were there. Fun fact - to reduce the danger of fire on the hillside, The Getty hires a herd of goats each Spring to help clear brush by munching on it. 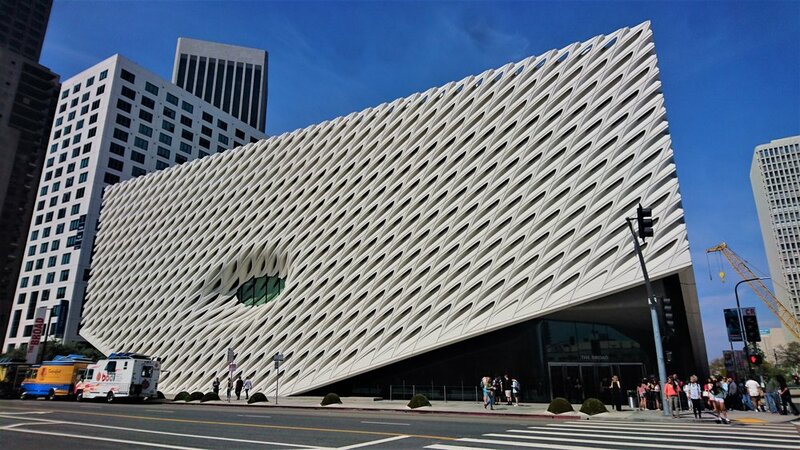 Downtown LA’s contemporary art museum The Broad boasts a collection of works from Jean-Michel Basquiat, Roy Lichtenstein, Andy Warhol, Barbara Kruger to Jeff Koons and Takashi Murakami. If these names mean anything to you, you will want to go now. Even if you are not so keen on modern art, it will be a fun experience if you approach it with an open mind. General admission is free, however, to get the tickets, we suggest you book online in advance to avoid massive queues. If you are planning a visit, consider joining their mailing list as a reminder as the tickets are released a month in advance (tickets for June are released May 1st etc) and they book out quite quickly. It might sound a bit grim at first but it really is a unique kind of cemetery. The final resting place to Hollywood stars, directors and performers, you can find a map of some of the most famous graves here. It’s actually quite a nice park for a leisurely stroll whilst looking up graves of your favourite desceased famous people. 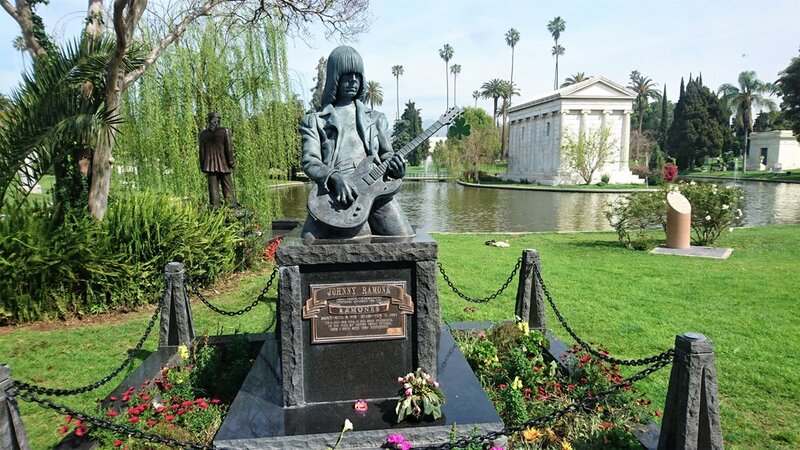 We were searching for ages to spot Mila Nurmi (Vampira) but we had no trouble finding Johnny Ramone who has probably the best and definitely most rock n roll gravestone. 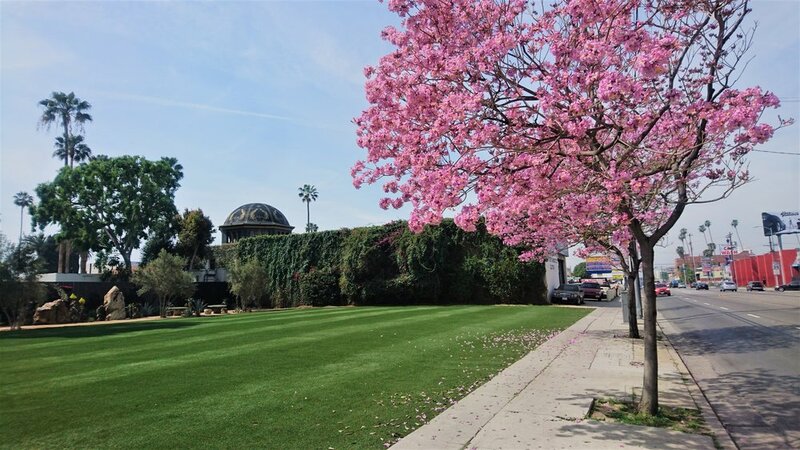 Hollywood Forever hosts film screenings during Summer and even live music on location. 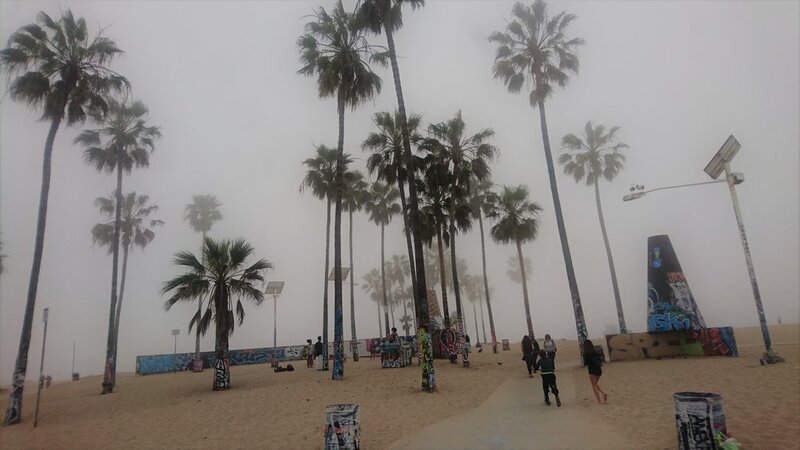 Walking down (or grab a bike) along Santa Monica pier and making a quick stop to gawk at the gymnastics at Muscle beach, you will eventually reach one of LA’s iconic landmarks - Venice Beach. Golden State is the home of modern skateboarding and Venice beach in particular is steeped in revolutionary skateboarding history. If you want to know more about it, look up Dogtown and Z-Boys. 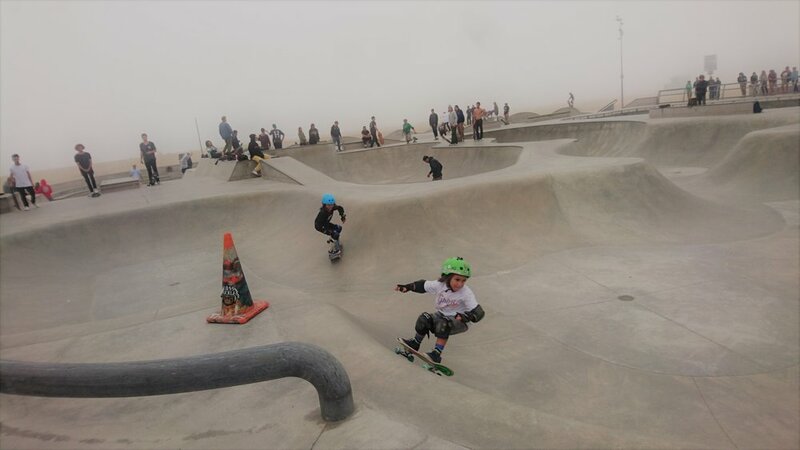 The oceanfront skatepark is now a permanent fixture here and it’s packed with local skaters pulling tricks to a crowd of spectators daily. It has a good communal vibe to it and if you don’t feel too intimidated to get in the way of the little rippers who have probably learned to skate before they learned to walk, everyone is welcome to join in. If you are not into skateboarding, there are plenty of street performers and eccentric artists hustling away and an eccentric buzz of the place to hold your interest. We happened to be there on an exceptionally foggy and chilly day but it did not taint the vibe of the place one bit. Last but definitely the most obvious one. Really, there’s not that much to say about this that you do not know. There are stars on the ground with lots of famous names. We suggest you do the whole thing twice - first time stop at every star and excitingly exclaim what it says and to everyone’s annoyance proceed to take (or try) to take awkward pictures on the ground and then do the second round when you’re already bored with all of the stars and actually look up and see what else is around. If you are very extra about your late 90s witch TV series and have some time to spare, you can go and have a look at the Halliwell Manor from The Charmed. The series was set in San Francisco but the filming location is actually in LA on 1329 Carroll Ave, CA 90026. It is a private residence and there are no tours to see inside but the whole neighbourhood has beautiful and peculiar looking houses dotted all around which you are free to explore without being a complete creep. The house that is featured in Michael Jackson’s Thriller video is just another door down as well. 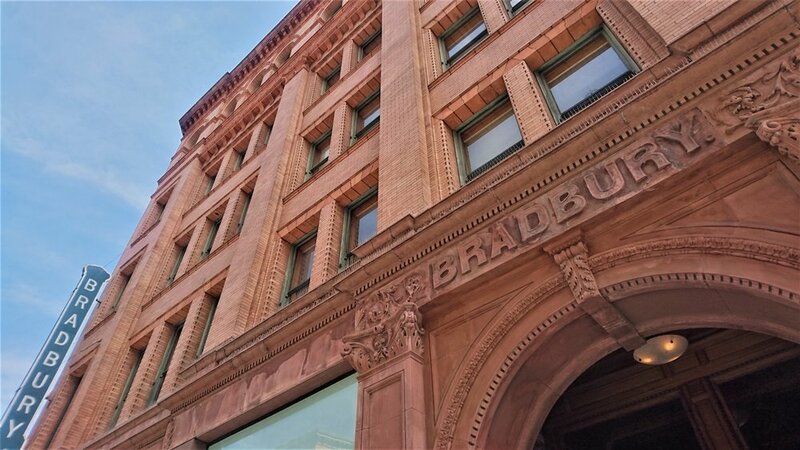 Another famous construction that has been captured on film is Bradbury building. 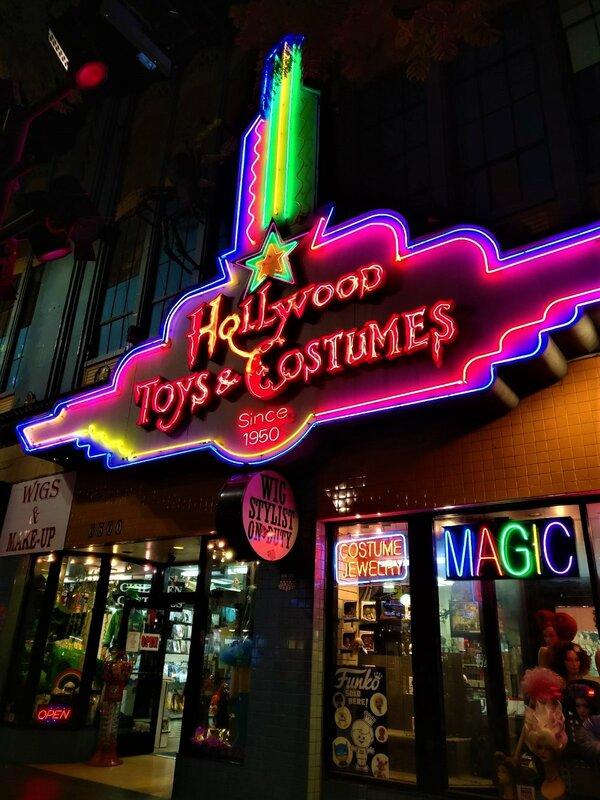 Located in downtown LA, its most famous appearance is in 1982’s Blade Runner. Unfortunately it was closed the time we were there, but on a normal day you can actually get inside the lobby. If you are interested in knowing more about the building, there is a good article here.